Pedestrianism was the name given to professional running and walking in the 19th century. Endurance walking, in which competitors walked around indoor circuits over very long distances, was one of the more popular pedestrian events. New Zealander Joe Scott was a champion endurance walker. 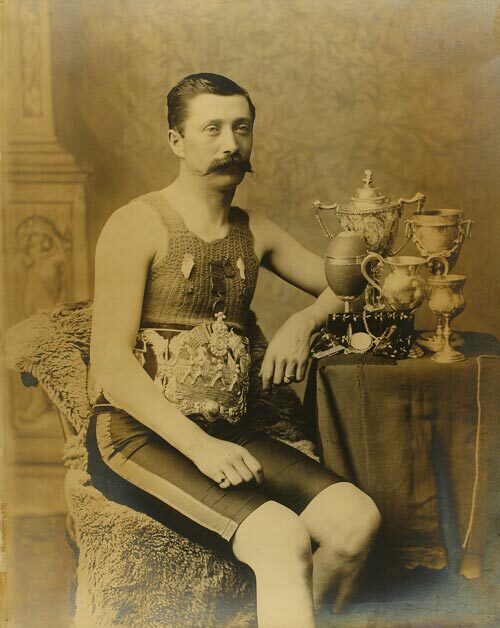 Here, he is wearing the world championship belt he won in London in 1888, alongside trophies he won for other events. Permission of the Otago Settlers Museum must be obtained before any re-use of this image.